I've never seen this colorization on a tomato plant...followed by die off of the branch. Note the GRAY leaf color. Looks like sunburn/sunscald. Was the plant in a shaded or Indoor location and did you just plant it in the last day or two? I don't know. Doesn't look just like sun scald to me, but something terrible happened to this poor plant. It looks like it was kept in the dark with no nutrients for a long time. Growing in the dark etiolates (bleaches out) plants and growing with not enough light causes them to stretch out very tall and thin, with a lot of stem space between the leaf nodes. Growing with not enough nutrients causes them to have few leaves and generally weak. Your plant looks like all of those. It looks like it was grown in a closet for six weeks and then recently planted in the ground. And incidentally your soil looks very bad. The plant looks anemic all around. The soil looks very gray. I am thinking the soil did not have a lot of nutrients, it may be alkaline and that is why the leaves look a little purple (phosphorus) and why the plant is so small and yellow over all. Low in nitrogen and phosphorus. How was the soil prepared and was it tested first? Did you do any amending before planting? What fertilizer are you giving it? Honestly, I wouldn't waste any more time on this pitiful plant. It has been so stressed and stunted, it will never produce for you. You didn't say where you are located. If you are going into fall, it is time to quit thinking about having tomatoes in your garden. Over winter read up about tomato care and work on amending your soil and get off to a better start next year. From the plants in the background, it looks like you are in a warm spot. They look very healthy. 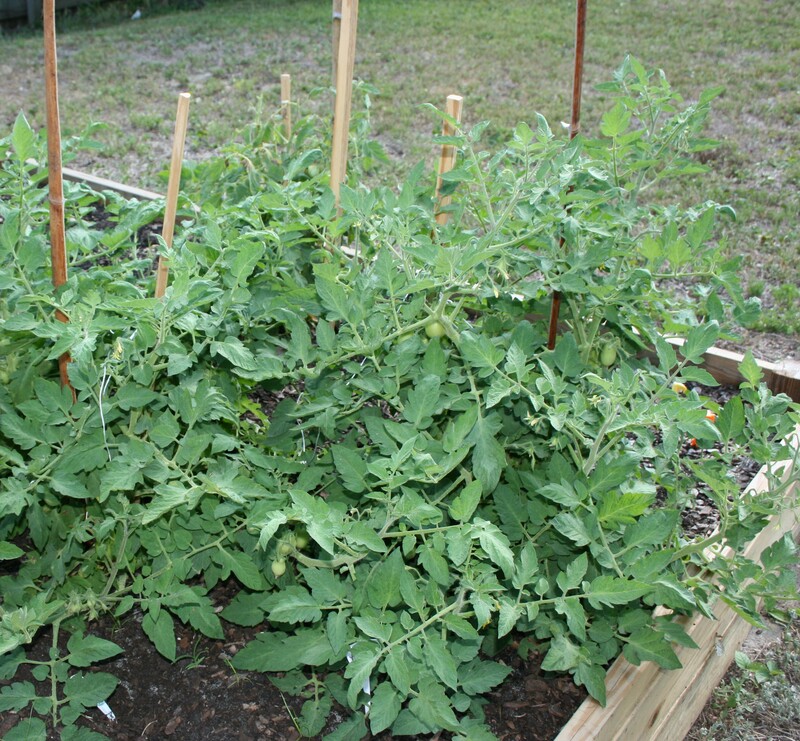 Tomatoes will grow year round in a frost free climate, but you will have more problems with fungal disease in the monsoon season Tomatoes like a soil that is rich in nutrients and slightly acidic with a pH 5.5-6.8. Alkaline conditions will lock up micronutrients and plants will be small. Wood ashes and chicken manure will make soil more alkaline as well as adding dolomite lime that is not needed. Compost should be added to help retain moisture. Most aerated composts are alkaline. Peat moss is an acidic compost. Sulfur- fertilizer, insect and fungicide, and lowers pH of alkaline soils (takes 6 months and you should not try to lower pH more than 1 pt at a time. You need to know pH before attempting to adjust pH up or down. Dolomite lime- often added for calcium for tomatoes, however, also raises pH and makes soil more alkaline so it should not be added to alkaline soils or in large quantities or it will alter pH. Chicken manure - high in calcium, one of the highest organic nitrogen. Can raise pH by a half a point as it is alkaline from the calcium. Wood ashes - source of potassium,but is extremely alkaline so you cannot add too much or it will alter pH. Organic nutrient NPK will vary batch to batch and will generally be very low. It also takes about 6 months to 2 years for all of the nutrients to be released as it is in a form that must be converted by soil organisms before most of the nutrients (especially nitrogen) is in an inorganic form that the plants can use. If your soil is relatively poor to start with, it will take time for the soil microbe population to build. It is why most organic gardens get their best production after 3 years. To keep production up, organics require constant inputs of organic matter. Composts should be blended and made from a variety of sources. Homemade composts may not be hot composted so may contain weed seeds and all pathogens may not be killed so it is best not to compost any diseased plants. You need to be careful when adding things like wood ashes and dolomite lime because you can add too much. A soil test is best taken before you start amending the soil. If you ask for organic recommendations, it will tell you the quantities of manure, compost, and organic fertilizers you will need to add for nutrients and pH. Pots with potting soil, are a relatively sterile mix and do not contain a large amount of soil microbes so it is difficult to do organics in pots unless you supplement heavily with fish emulsion, kelp meal, compost and manure teas on a weekly basis. Since you have to constantly be supplementing nutrients organic pot culture is really not sustainable and does not help the soil which is the intent of organic farming practices. I think soil is biggest part, looks very bad. I don't know if u did or not but I would have mixed a lot of fresh soil/compost to give that dirt some life. I do my tomatoes in pots with fresh potting soil/compost. I get a good little haul by end of season. Anyway like I said I would maybe try mixing some fresh soil/compost into the ground. Maybe someone else will have same idea or different idea. WHY is the soil so GRAY color is that wood ash or did you spill a bag of cement? Soil in the background looks brown. Did anyone notice this thread is from Sept? .